The tempo was nice and easy, and it was good we could customize the trip as we went. Honda 160cc and Honda Wave 100cc. Riding across Vietnam was fun and the motorcycles made getting to certain areas a lot easier than would have been in a car. 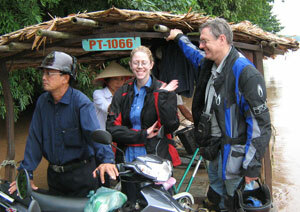 The home stays are a good way of getting to know more about the Vietnamese culture & traditions. You will never go hungry. There is so much food. The guide (Minh) was knowledgeable & helpful & was good at setting a pace that was comfortable & pointing out things that we might otherwise have missed. Address: 3 Town Rd, Glenbrook, Vic., AUSTRALIA 3783.